These cupcakes were almost a no-go with a recent frosting fail. Luckily, I was able to improvise! I thought I’d try a new frosting recipe that I found online. I should have known something was off by looking at the ingredients though. They had originally said 2+ cups of heavy cream and a 1/4 cup icing sugar. Maybe the author had some success with it, but I sure didn’t. It was like frosting soup! From now on, I’ll stick to my tried-and-true frosting recipes and trust my gut instincts. 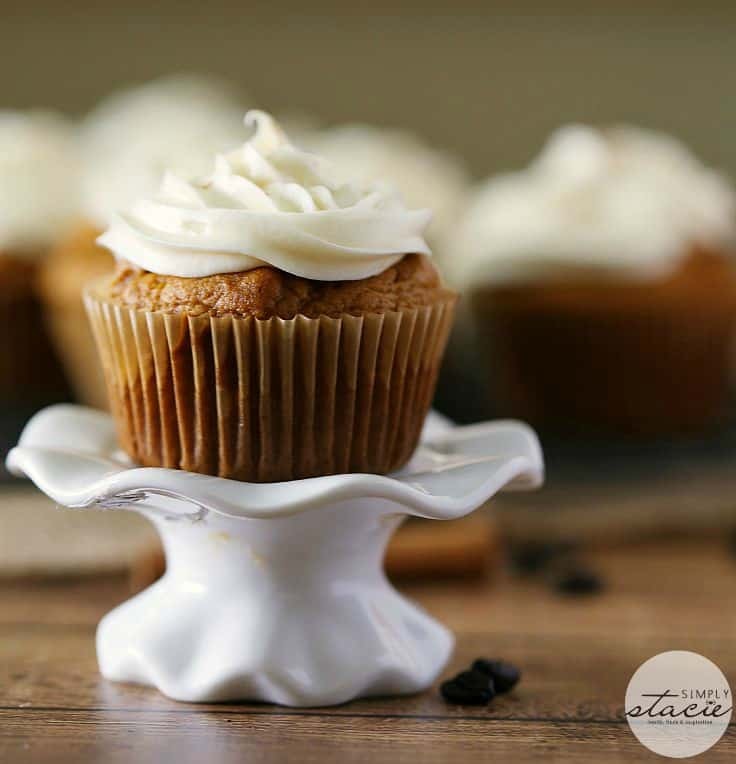 Even frosting-less, these Pumpkin Spice Latte Cupcakes would still be tasty! You can taste the hint of coffee mixed with pumpkin in each bite. I used brewed coffee since I know not everyone has an old fashioned coffee maker that gives you ground coffee. If you have one, you can use the ground coffee in the mix. I saved a bit of my morning coffee to use in the recipe. If you wanted to use a store-bought frosting to save time, go right ahead. Try French Vanilla, Vanilla or Cream Cheese flavoured. Yum! I couldn’t wait to sink my teeth into one of these guys. I’m not one to lick the frosting off first and then eat the cupcake. Instead, I take a big bite and get the whole experience of sweetness and texture. My picky kids even liked them. Olivia brought one in her lunch. She’s fussy with food – even dessert! It made me happy to see her enjoying my baking. All the coffee shops have their pumpkin baked goods out right now. I think this recipe is even better. Plus, it’s a lot cheaper to make your own! Craving more pumpkin spice? 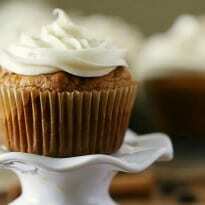 Try my Pumpkin Spice Cake Cups! 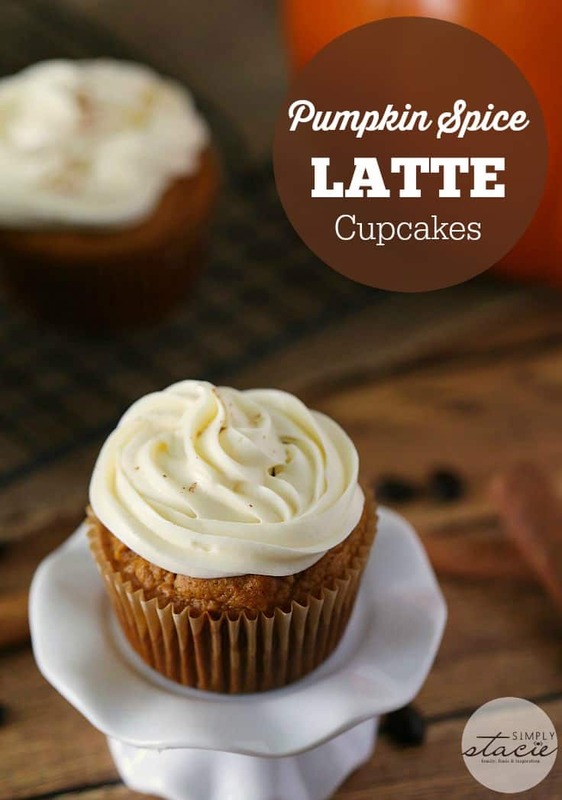 Are you baking lots of pumpkin spice items this month? Craving pumpkin baked goods? 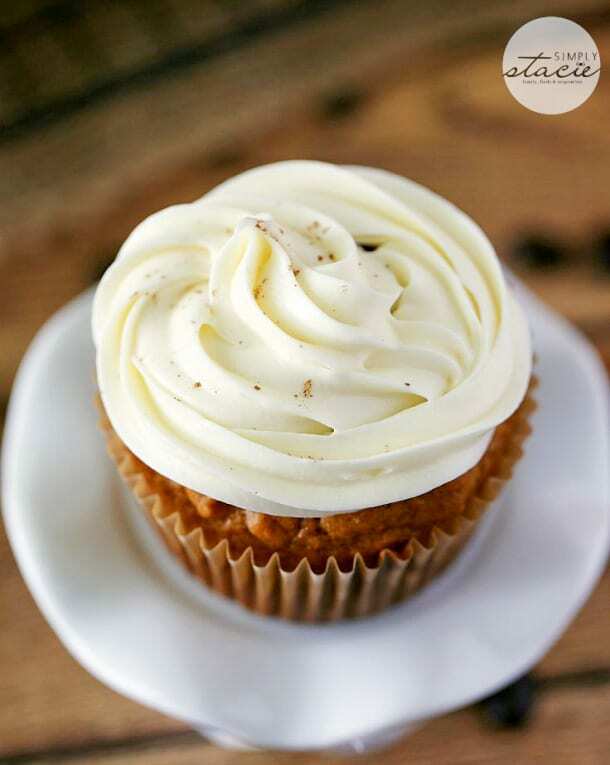 Look no further than these divine Pumpkin Spice Latte Cupcakes recipe to capture the taste of fall! Preheat oven to 350F. Place cupcake liners in your cupcake pan. In a large bowl, mix together the flour, baking soda, baking powder, cinnamon, nutmeg, cloves and salt. In another bowl, add pumpkin, sugar, brown sugar, milk, coffee and oil. Beat together until combined. Add eggs, one at a time to the wet mixture, beat well after you add each egg. With the mixture on low speed, add the flour mixture in two halves, mixing just until well mixed. Fill cupcake liners with batter about 3/4 way full. Bake for 18-20 minutes, until a toothpick inserted into the center of a cupcake comes out clean. Let cool for 20 minutes in the cupcake pan. Then move them to a wire rack to continue to cool. Once they have cooled, top with the frosting. To make the frosting, add all your ingredients to a large bowl. Beat on medium until smooth. 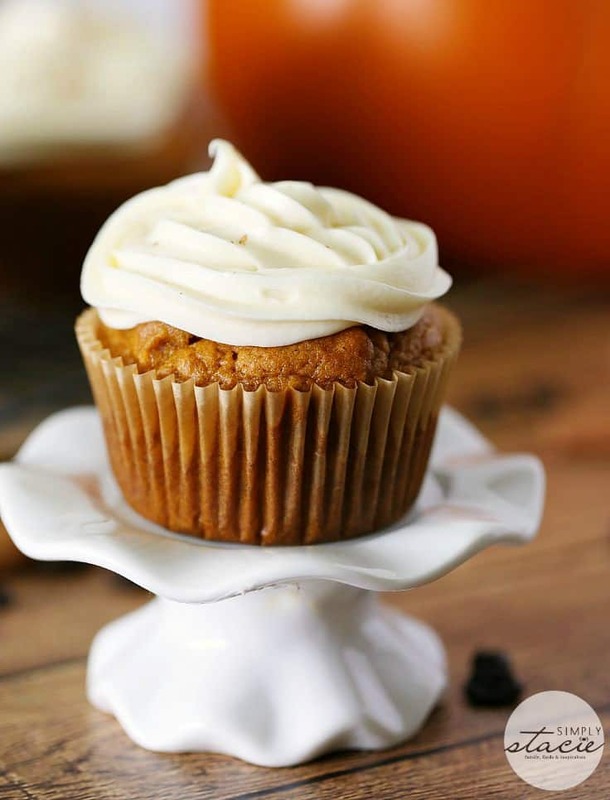 These cupcakes look absolutely delicious and I love the use of pumpkin. Those are beautiful looking cupcakes! These cupcakes look so delicious so I had to pin them to make them for my family . Great for the holidays too. Oh my goodness these look ah-mazing!! Ty for sharing, I will definitely be trying the recipe! Yummy! They look amazing! Pinning it to Yummy Recipe Board! These sound like good cupcakes! Was the heavy cream in the frosting recipe supposed to be whipped? No I didn’t whip it. I love all your pumpkin spice recipes and this one looks delicious! love all things pumpkin! Going to try these! These look amazing! Visiting from Chic on a Shoestring. I need this recipe. Thanks for sharing. We were just talking about making pumpkin recipes soon. My daughter & I love to bake together. lol by the sound of it, it was probably supposed to be 1/4 cup of the heavy whipping cream and 2+ cups of the icing sugar…maybe she accidently mixed them up? So glad that you could salvage your icing though. These look fantastic (wonderful pictures)! Thank you for sharing! What an awesome flavor combination. My favorite! Sorry about your frosting fail. Glad you were able to make it work. They look fabulous! Your recipe is featured on The Top Ten of Full Plate Thursday this week. Hope you are having a great day and enjoy your new Red Plate. I was wondering if the milk in the frosting is plain milk or heavy cream. I used just regular milk. Ok I have what’s probably a dumb question… What am I adding the flour mixture to in step five? I figured it was the wet mixture that I would have just added to eggs to, but then step six says to add the wet mixture to the dry mixture, so now I’m completely confused and I feel like I’m missing something…? Not a dumb question at all! Actually thanks for pointing that out. I had an extra sentence in there that was confusing! I took it out and it should make better sense now. Sorry for the confusion! Ok two more questions… 1. Did you make your own pumpkin puree or did you use a can? 2. What roast was your coffee? No, I used canned pumpkin puree. Any roast of coffee is fine! Great. Thanks again! I promise I won’t bother you with anymore questions, haha. These look great and Im going to be trying them soon! About your comment on the “soupy frosting” with the 2 cups heavy cream and 1/4 cup powdered sugar…. this is the way to make a stabilized whipped cream for cupcakes. I love doing it this way because its so much easier than a method with gelatin (which I never tried since this is so easy!). You just whip the cream to soft peaks with the whisk attachment to your stand mixer, add the powdered sugar and continue to whip a minute or so. You may need to add a bit more powdered sugar. Try it, its a beautiful topping for cupcakes! Maybe a soy milk or almond milk?